"PS2" redirects here. For the lineup of IBM computers, see IBM Personal System/2. For the port itself, see PS/2 port. For other uses, see PS2 (disambiguation). The PlayStation 2 (PS2) is a home video game console developed and marketed by Sony Computer Entertainment. It was first released in Japan on March 4, 2000, in North America on October 26, 2000, and in Europe and Australia in November 2000, and is the successor to the original PlayStation, as well as the second installment in the PlayStation console lineup. As a sixth generation console, the PS2 competed with Sega's Dreamcast, Nintendo's GameCube, and Microsoft's Xbox. Announced in 1999, the PS2 offered backwards compatibility for its predecessor's DualShock controller, as well as its games. The PS2 is the best-selling video game console of all time, having sold over 155 million units, with 150 million confirmed by Sony in 2011. Over 3,800 game titles have been released for the PS2 since launch, with over 1.5 billion copies sold. Sony later manufactured several smaller, lighter revisions of the console known as Slimline models in 2004. In 2006, Sony announced and launched its successor, the PlayStation 3. Even with the release of its successor, the PS2 remained popular well into the seventh generation, and continued to be produced until January 4, 2013, when Sony finally announced it had been discontinued after twelve years of production – one of the longest lifespans of a video game console. Despite the announcement, new games for the console continued to be produced until the end of 2013, including Final Fantasy XI: Seekers of Adoulin for Japan, FIFA 13 for North America, and Pro Evolution Soccer 2014 for Europe. Repair services for the system in Japan ended on September 7, 2018. Though Sony has kept details of the PlayStation 2's development secret, work on the console began around the time that the original PlayStation was released (in late 1994). Insiders stated that it was developed in the U.S. West Coast by former members of Argonaut Software. By 1997 word had leaked to the press that the console would have backwards compatibility with the original PlayStation, a built-in DVD player, and Internet connectivity. Sony announced the PlayStation 2 (PS2) on March 1, 1999. The video game console was positioned as a competitor to Sega's Dreamcast, the first sixth-generation console to be released, although ultimately the main rivals of the PS2 were Nintendo's GameCube and Microsoft's Xbox. The Dreamcast itself launched very successfully in North America later that year, selling over 500,000 units within two weeks. Soon after the Dreamcast's North American launch, Sony unveiled the PlayStation 2 at the Tokyo Game Show on September 20, 1999. Sony showed fully playable demos of upcoming PlayStation 2 games including Gran Turismo 2000 (later released as Gran Turismo 3: A-Spec) and Tekken Tag Tournament – which showed the console's graphic abilities and power. The PS2 was launched in March 2000 in Japan, October in North America, and November in Europe. Sales of the console, games and accessories pulled in $250 million on the first day, beating the $97 million made on the first day of the Dreamcast. Directly after its release, it was difficult to find PS2 units on retailer shelves due to manufacturing delays. Another option was purchasing the console online through auction websites such as eBay, where people paid over a thousand dollars for the console. The PS2 initially sold well partly on the basis of the strength of the PlayStation brand and the console's backward compatibility, selling over 980,000 units in Japan by March 5, 2000, one day after launch. This allowed the PS2 to tap the large install base established by the PlayStation – another major selling point over the competition. Later, Sony added new development kits for game developers and more PS2 units for consumers. The PS2's built-in functionality also expanded its audience beyond the gamer, as its debut pricing was the same or less than a standalone DVD player. This made the console a low cost entry into the home theater market. The success of the PS2 at the end of 2000 caused Sega problems both financially and competitively, and Sega announced the discontinuation of the Dreamcast in March 2001, just 18 months after its successful Western launch. Despite the Dreamcast still received support through 2001, the PS2 remained as the only sixth generation console with an eye on the future for over 6 months before it would face competition from newer rivals; Nintendo's GameCube and Microsoft's Xbox, which were then released. Many analysts predicted a close three-way matchup among the three consoles; the Xbox having the most powerful hardware, while the GameCube was the least expensive console, and Nintendo changed its policy to encourage third-party developers. While the PlayStation 2 theoretically had the weakest specification of the three, it had a head start due to its installed base plus strong developer commitment, as well as a built-in DVD player (the Xbox required an adapter, while the GameCube lacked support entirely). While the PlayStation 2's initial games lineup was considered mediocre, this changed during the 2001 holiday season with the release of several blockbuster games that maintained the PS2's sales momentum and held off its newer rivals. Sony also countered the Xbox by temporarily securing PlayStation 2 exclusives for highly anticipated games such as the Grand Theft Auto series and Metal Gear Solid 2: Sons of Liberty. Sony, unlike Sega with its Dreamcast, originally placed little emphasis on online gaming during its first few years, although that changed upon the launch of the online-capable Xbox. Coinciding with the release of Xbox Live, Sony released the PlayStation Network Adapter in late 2002, with several online first–party titles released alongside it, such as SOCOM: U.S. Navy SEALs to demonstrate its active support for Internet play. Sony also advertised heavily, and its online model had the support of Electronic Arts (EA); EA did not offer online Xbox titles until 2004. Although Sony and Nintendo both started out late, and although both followed a decentralized model of online gaming where the responsibility is up to the developer to provide the servers, Sony's moves made online gaming a major selling point of the PS2. In September 2004, in time for the launch of Grand Theft Auto: San Andreas, Sony revealed a newer, slimmer PS2. In preparation for the launch of the new models (SCPH-700xx-9000x), Sony stopped making the older models (SCPH-3000x-500xx) to let the distribution channel empty its stock of the units. After an apparent manufacturing issue – Sony reportedly underestimated demand – caused some initial slowdown in producing the new unit caused in part by shortages between the time the old units were cleared out and the new units were ready. The issue was compounded in Britain when a Russian oil tanker became stuck in the Suez Canal, blocking a ship from China carrying PS2s bound for the UK. During one week in November, British sales totalled 6,000 units – compared to 70,000 units a few weeks prior. There were shortages in more than 1,700 stores in North America on the day before Christmas. PlayStation 2 software is distributed on CD-ROM and DVD-ROM. In addition the console can play audio CDs and DVD movies, and is backwards compatible with PlayStation games. The PS2 also supports PlayStation memory cards and controllers, although original PlayStation memory cards only work with original PlayStation games and the controllers may not support all functions (such as analog buttons) for PS2 games. The console also features 2 USB ports, and 1 IEEE 1394 (Firewire) port (SCPH-10000 to 3900x only). A hard disk drive can be installed in an expansion bay on the back of the console, and is required to play certain games, notably the popular Final Fantasy XI. This is only available on certain models. The hardware uses the Emotion Engine CPU, a custom-designed processor based on the MIPS architecture with a floating point performance of 6.2 GFLOPS, and the custom-designed Graphics Synthesizer GPU, with a fillrate of 2.4 gigapixels/second, capable of rendering up to 75 million polygons per second. When accounting for features such as lighting, texture mapping, artificial intelligence, and game physics, it has a real-world performance of 3 million to 16 million polygons per second. The PlayStation 2 may natively output video resolutions on SDTV and HDTV from 480i to 480p while other games, such as Gran Turismo 4 and Tourist Trophy are known to support up-scaled 1080i resolution using any of the following standards: composite video (480i), S-Video (480i), RGB (480i/p), VGA (for progressive scan games and PS2 Linux only), YPBPR component video (which display most original PlayStation games in their native 240p mode which most HDTV sets do not support), and D-Terminal. Cables are available for all of these signal types; these cables also output analog stereo audio. Additionally, an RF modulator is available for the system to connect to older TVs. Digital (S/PDIF) audio may also be output by the console via its TOSLINK connector which outputs 2.0 PCM, and 5.1 channel sound in Dolby Digital and DTS formats. The PS2's controller, the DualShock 2, had the same form factor as the PlayStation DualShock. The PS2 is primarily differentiated between models featuring the original "fat" case design and "slimline" models, which were introduced at the end of 2004. In 2010, the Sony Bravia KDL-22PX300 was made available to consumers. It was a 22" HD-Ready television which incorporated a built-in PlayStation 2. A class action lawsuit was filed against Sony Computer Entertainment America Inc. on July 16, 2002, in the Superior Court of California, County of San Mateo. The lawsuit addresses consumer reports of inappropriate "no disc error" (disc read error) messages and other problems associated with playing DVDs and CDs on the PlayStation 2. Sony settled its "disc read error" lawsuit by compensating the affected customers with US$25, a free game from a specified list, and the reduced cost repair or replacement (at SCEA's discretion) of the damaged system. This settlement was subject to the courts' approval, and hearings began in the US and Canada on April 28, 2006, and May 11, 2006, respectively. PlayStation 2 software is distributed on CD-ROM and DVD-ROM; the two formats are differentiated by the color of their discs' bottoms, with CD-ROMs being blue and DVD-ROMs being silver. The PlayStation 2 offered some particularly high-profile exclusive games. Most main entries in the Grand Theft Auto, Final Fantasy, and Metal Gear Solid series were released exclusively for the console. Several prolific series got their start on the PlayStation 2, including God of War, Ratchet & Clank, Jak and Daxter, Devil May Cry, Kingdom Hearts, and Sly Cooper. Grand Theft Auto: San Andreas was the best-selling game on the console. Game releases peaked in 2004, but declined with the release of the PlayStation 3 in 2006. The last new game for the console in Asia is Final Fantasy XI: Seekers of Adoulin, in North America is FIFA 13, and in Europe is Pro Evolution Soccer 2014. As of June 30, 2007, a total of 10,035 software titles have been released worldwide (counting games released in multiple regions as separate titles). Slim model with network adapter. PlayStation 2 users had the option to play select games over the Internet, using a broadband Internet connection and a PlayStation 2 Network Adaptor. Instead of having a unified, subscription-based online service like Xbox Live as competitor Microsoft later chose for its Xbox console, online multiplayer functionality on the PlayStation 2 was the responsibility of the game publisher and ran on third-party servers. Most recent[when?] PlayStation 2 online games have been developed to exclusively support broadband Internet access. Xbox Live similarly requires a broadband Internet connection. The PlayStation 2 has sold over 150 million units worldwide as of March 31, 2012. In Europe, it has sold 48 million units as of May 6, 2008, according to Sony Computer Entertainment Europe, while in North America, it has sold 50 million units as of December 2008. In Japan, the PS2 has sold 21,454,325 units as of October 1, 2008, according to Famitsu/Enterbrain. In 2005, the PlayStation 2 became the fastest game console to reach 100 million units shipped, accomplishing the feat within 5 years and 9 months from its launch. The PlayStation 2's DualShock 2 controller is largely identical to the PlayStation's DualShock, with the same basic functionality. However, it includes analog pressure sensitivity on the face, shoulder and D-pad buttons, replacing the digital buttons of the original. (These buttons would later become digital again with the release of the DualShock 4.) Like its predecessor, the DualShock 2 controller has force feedback, or "vibration" functionality. It is lighter and includes two more levels of vibration. Optional hardware includes additional DualShock or DualShock 2 controllers, a PS2 DVD remote control, an internal or external hard disk drive (HDD), a network adapter, horizontal and vertical stands, PlayStation or PS2 memory cards, the multitap for PlayStation or PS2, a USB motion camera (EyeToy), a USB keyboard and mouse, and a headset. The original PS2 multitap (SCPH-10090) cannot be plugged into the newer slim models, as the multitap connects to the memory card slot as well as the controller slot and the memory card slot on the slimline is shallower. New slim-design multitaps (SCPH-70120) were manufactured for these models, however third-party adapters also exist to permit original multitaps to be used. Early versions of the PS2 could be networked via an i.LINK port, though this had little game support and was dropped. Some third party manufacturers have created devices that allow disabled people to access the PS2 through ordinary switches, etc. Some third-party companies, such as JoyTech, have produced LCD monitor and speaker attachments for the PS2, which attach to the back of the console. These allow users to play games without access to a television as long as there is access to mains electricity or a similar power source. These screens can fold down onto the PS2 in a similar fashion to laptop screens. There are many accessories for musical games, such as dance pads for Dance Dance Revolution, In the Groove, and Pump It Up titles and High School Musical 3: Senior Year Dance. Konami microphones for use with the Karaoke Revolution games, dual microphones (sold with and used exclusively for SingStar games), various "guitar" controllers (for the Guitar Freaks series and Guitar Hero series), the drum set controller (sold in a box set (or by itself) with a "guitar" controller and a USB microphone (for use with Rock Band and Guitar Hero series, World Tour and newer), and a taiko drum controller for Taiko: Drum Master. Specialized controllers include light guns (GunCon), fishing rod and reel controllers, a Dragon Quest VIII "slime" controller, a Final Fantasy X-2 "Tiny Bee" dual pistol controller, an Onimusha 3 katana controller, and a Resident Evil 4 chainsaw controller. Unlike the PlayStation, which requires the use of an official Sony PlayStation Mouse to play mouse-compatible games, the few PS2 games with mouse support work with a standard USB mouse as well as a USB trackball. 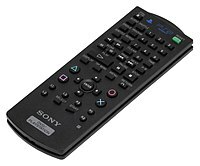 In addition, some of these games also support the usage of a USB keyboard for text input, game control (in lieu of a DualShock or DualShock 2 gamepad, in tandem with a USB mouse), or both. Using homebrew programs, it is possible to play various audio and video file formats on a PS2. Homebrew programs can also be used to play patched backups of original PS2 DVD games on unmodified consoles, and to install retail discs to an installed hard drive on older models. Homebrew emulators of older computer and gaming systems have been developed for the PS2. Sony released a Linux-based operating system, Linux for PlayStation 2, for the PS2 in a package that also includes a keyboard, mouse, Ethernet adapter and HDD. In Europe and Australia, the PS2 comes with a free Yabasic interpreter on the bundled demo disc. This allows users to create simple programs for the PS2. A port of the NetBSD project and BlackRhino GNU/Linux, an alternative Debian-based distribution, are also available for the PS2. ^ プレイステーション2の日本国内での出荷が本日（2012年12月28日）で完了. Famitsu (in Japanese). Enterbrain. December 28, 2012. Retrieved December 28, 2012. ^ a b "PlayStation 2 manufacture ends after 12 years". The Guardian. January 4, 2013. Retrieved January 4, 2013. ^ a b "Slimmer, Lighter PlayStation 3, new PlayStation Network services, plenty of content and a great value price" (PDF) (Press release). Sony Computer Entertainment. August 18, 2009. p. 2. Archived from the original (PDF) on September 2, 2009. Retrieved February 24, 2013. ^ a b "PlayStation2 Worldwide Hardware Unit Sales". Sony Computer Entertainment. Archived from the original on November 1, 2013. Retrieved February 23, 2013. ^ a b c Diefendorff, Keith (April 19, 1999). "Sony's Emotionally Charged Chip" (PDF). Microprocessor Report. 13 (5). ^ Shiloy, Anton (February 26, 2007). "Sony Removes Emotion Engine, Graphics Synthesizer from PAL PlayStation 3". X-bit labs. Archived from the original on October 26, 2016. Retrieved May 7, 2014. ^ Shimpi, Anand. "Rambus DRAM: Uncovering Facts & Burying Rumors". AnandTech. Archived from the original on February 19, 2017. Retrieved February 19, 2017. ^ Perry, Douglass C. "The Untapped Power of PlayStation 2". IGN. Archived from the original on February 18, 2017. Retrieved February 18, 2017. ^ Leadbetter, Richard (July 21, 2012). "Digital Foundry vs. PS2 Classics on PlayStation 3". Archived from the original on August 6, 2012. Retrieved February 19, 2017. ^ Guinness (February 2009). Guinness World Records 2009 Gamer's Edition. pp. 108–109. ISBN 978-1-904994-45-9. GTA: San Andreas is the best-selling PlayStation 2 game, with a massive 17.33 million copies sold. ^ "PLAYSTATION2 sales reach 150 million units worldwide". Sony Computer Entertainment. February 14, 2011. Archived from the original on February 18, 2011. Retrieved February 14, 2011. ^ Makuch, Eddie (February 15, 2011). "150 million PS2 units shipped worldwide – News at GameSpot". Asia.gamespot.com. Archived from the original on March 22, 2011. Retrieved March 27, 2011. ^ "Letters". Next Generation. No. 22. Imagine Media. October 1996. p. 203. ^ a b "Saturn/PS-X Sequels". Next Generation. No. 27. Imagine Media. March 1997. p. 24. ^ "Gaming Gossip". Electronic Gaming Monthly. No. 93. Ziff Davis. April 1997. p. 28. ^ Whitehead, Dan (February 1, 2009). "Dreamcast: A Forensic Retrospective Article • Page • Articles • Retro •". Eurogamer.net. Retrieved October 21, 2012. ^ "PlayStation 2 Timeline". GameSpy. p. 3. Archived from the original on June 4, 2004. Retrieved August 19, 2008. ^ "A Look Back at the Sega Dreamcast". Archived from the original on January 18, 2016. Retrieved December 30, 2016. ^ Perry, Douglass C. (September 20, 1999). "TGS 1999: Sony's Grand Showing". Retrieved December 30, 2016. ^ "Roosevelt Creative Arts Middle School –". Retrieved December 30, 2016. ^ Sony Pulls in Over $250 Million at Launch. IGN. Retrieved on August 23, 2013. ^ "PlayStation 2 Timeline". GameSpy. pp. 2–3. Archived from the original on June 4, 2004. Retrieved December 19, 2007. ^ "PS2 history". gamesindustry.biz. November 22, 2006. Archived from the original on October 11, 2007. Retrieved September 25, 2007. ^ "PlayStation 2 Timeline". GameSpy. p. 3. Archived from the original on June 4, 2004. Retrieved December 19, 2007. ^ "PlayStation 2 Timeline". GameSpy. p. 2. Archived from the original on June 4, 2004. Retrieved December 19, 2007. ^ What Ever Happened To The Dreamcast?. TechnoBuffalo. Retrieved on August 23, 2013. ^ "Hardware Behind the Consoles - Part II: Nintendo's GameCube". AnandTech. Retrieved October 21, 2012. ^ Morris, Chris (May 14, 2002). "Sony slashes PlayStation prices: Preemptive move undercuts competition and could spark video game price war". CNN. ^ Gaither, Chris. "Sony to Cut PlayStation 2 Price by $100." New York Times: 0. May 14, 2002. ProQuest. Web. July 29, 2013. ^ "Sony to Cut Price of PlayStation 2 in Japan Market --- Move Follows Plan to Lower Cost of Product in U.S. by a Third." Asian Wall Street Journal: 0. May 15, 2002. ProQuest. Web. July 29, 2013. ^ a b "Sony to Cut Price of PlayStation 2 Game Console by 20 Percent." Knight Ridder Tribune Business News: 1. November 4, 2003. ProQuest. Web. July 29, 2013. ^ Elliott, Valerie (December 9, 2004). "Merry Christmas, your PlayStation 2 is stuck in Suez". Times Online. News International. ^ "2004 Holiday Sales Results Call". GameStop. Retrieved September 9, 2006. ^ "Final Fantasy XI Review for PlayStation 2 – GameSpot". Uk.gamespot.com. March 23, 2004. Archived from the original on July 21, 2011. Retrieved November 11, 2010. ^ a b Casamassina, Matt (November 3, 2000). "Gamecube Versus PlayStation 2". IGN. Retrieved November 14, 2014. ^ "Gran Turismo 4 - #9 Top PS2 Games". IGN. Retrieved March 1, 2016. ^ Calvert, Justin (November 4, 2003). "PS2 price drop, new colors for Japan". GameSpot. Retrieved July 10, 2007. ^ Fahey, Rob (March 9, 2004). "Sony launches new PS2 colors in Japan". gamesindustry.biz. Archived from the original on September 30, 2007. Retrieved July 10, 2007. ^ "Cumulative Software Titles". Sony Computer Entertainment Inc. Archived from the original on September 21, 2008. Retrieved September 19, 2014. ^ Ellie Gibson (May 6, 2008). "PS3 has outsold Xbox 360 in Europe". Eurogamer. Retrieved October 25, 2008. ^ Koller, John (January 15, 2009). "PS2 Sells Over 50 Million Units in North America, Breaks Console Sales Record". PlayStation.Blog. Retrieved January 17, 2009. ^ Brightman, James (October 20, 2008). "Xbox 360 Growth in Japan Has Topped All Platforms from March to September". GameDaily. AOL. Archived from the original on March 16, 2010. Retrieved October 25, 2008. ^ "Dual Shock 2 Review". IGN. September 27, 2001. Retrieved February 7, 2011. The biggest difference between the Dual Shock 2 and the original… all of the buttons and even the digital pad offer analog support. This means that the d-pad, the four face buttons and the four shift buttons are all pressure-sensitive and have 255 degrees of sensitivity. It is also worth noting that the Dual Shock 2 is a bit lighter than the original Dual Shock because it appears to have less in the way of gears for the vibration function of the controller. ^ Cavalli, Earnest (October 24, 2013). "DualShock 4 drops analog buttons, citing lack of interest". Engadget. Retrieved August 16, 2015. ^ "PlayStation Knowledge Center | Support - PlayStation.com". Us.playstation.com. January 10, 2011. Retrieved March 27, 2011. This page was last edited on 20 April 2019, at 22:01 (UTC).